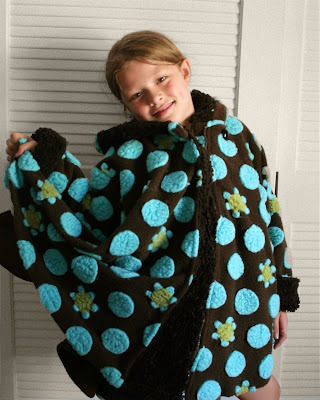 The Pea chose this Brown and Turquoise Polka Daisy Wrap Swing Girls Coat. It's fun and flirty and soft and cuddly and stylish and sweet all at the same time. She loves the dots and flower design, and the fur-lined hood with its fun, poufy tassel. I love how the sleeves roll up for now, so she can wear it all through this winter and maybe even into next winter. 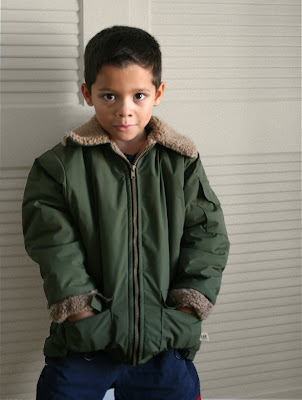 KidsCoats.com also has a great selection of Boys Jackets and Boys Coats. 3Po received this olive nylon coat with fleece sherpa lining. It has a removable hood and it looks as rugged and tough as 3Po. Actually, when I say he received it, I actually meant that he and Jammy fought like tigers for it, and somehow 3Po ended up with it. Maybe it's the aviator-jacket-vibe that made both boys reeeelly want this coat! I never dress them alike, but I do kind of like to have them in the same or matching outerwear, so I might just end up buying another of these coats. Not that Jammy ended up with the dregs or anything. 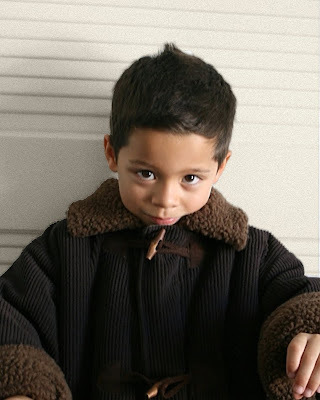 The third coat was a beautiful brown zip-up corduroy coat, with fleece sherpa lining and toggle closures. Alfie actually likes this one the best out of all 3 that we received; it's definitely more stylish and hip than 3Po's olive nylon hoodie. The photos speak for themselves. Actually, I'm a terrible photographer, and the photos don't do the coats justice. Oh. My. God. They are beautiful. They are the kinds of coats that make strangers approach you and ask where you got them. I am going to feel like a bag lady next to these kids -- I'd better go out and look for a grown-up coat that's as chic as theirs. Plus, they are soooo soft, The Pea says it's like being enveloped in a warm, snuggly blanket. Best of all, I love, love, love that all their coats are machine-washable! Hurrah, no dry cleaning! No need to grit my teeth when I see stains on their beautiful coats but force myself to wait until the coats are so grubby they can practically walk by themselves, then spend almost as much at the dry cleaners as the cost of the coat itself. There isn't much to complain about these coats -- they're great quality at a decent price. Sure, you can buy coats for less money, but you don't get the sturdiness, softness, or style. These are hand-me-down quality coats! Also, Kids Coats offers free shipping on all coats to the US, and up to $50 off when you join their mailing list. And don't you worry -- Bonggamom Finds will be coming out with a KidsCoats.com giveaway soon, so one lucky winner will get to win a fabulous Corky & Company coat! 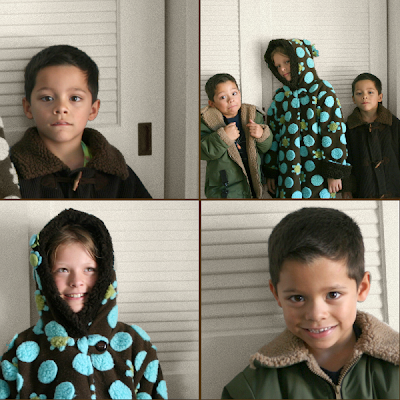 Parents and kids alike will love the coats sold at Kids Coats. Their Corky & Company coats are a super- stylish investment! These coats are the cutest things i have ever seen, as a mom i am always looking for the cross between the bulky winter coats and a fall coat for special occasions and shopping trips and these are for sure the answer to that. Their coats are amazing. The luxurious quality with the beautiful styling and colors any kid would be a star in one of them. I absolutely love how stylish the coats are! Your kids look adorable! I completely agree with you that sometimes it's worth a little extra money to have your kids be warm, happy & stylish! I have always been impressed by the Corky coats at Kid's Coats, they look like they are from another era, something my daughter would put on and twirl and feel like a real live princess! I am super impressed that they are machine washable, that's a huge plus in my book! They have such cute coats- i want them in my size. And I'm with you on LOVING the machine washable factor- so necessary with kids. They do look awfully soft! I love the styles/colors they have. I like that your review mentioned that they're "hand me down coats". That's important to us...we have 3 kids. These coats are so cute and stylish! My daughters would love these. these is really perfect for the kids. love the color, the style especially on the 1st photo. im sure the girls will love these coats, especially that there are flowers. I so love the pictures of the kids. Great post by the way.